Set of four blue Christmas ornaments by Shiny Brite. Two medium sized ornaments that are blue and white with silver glitter detail. 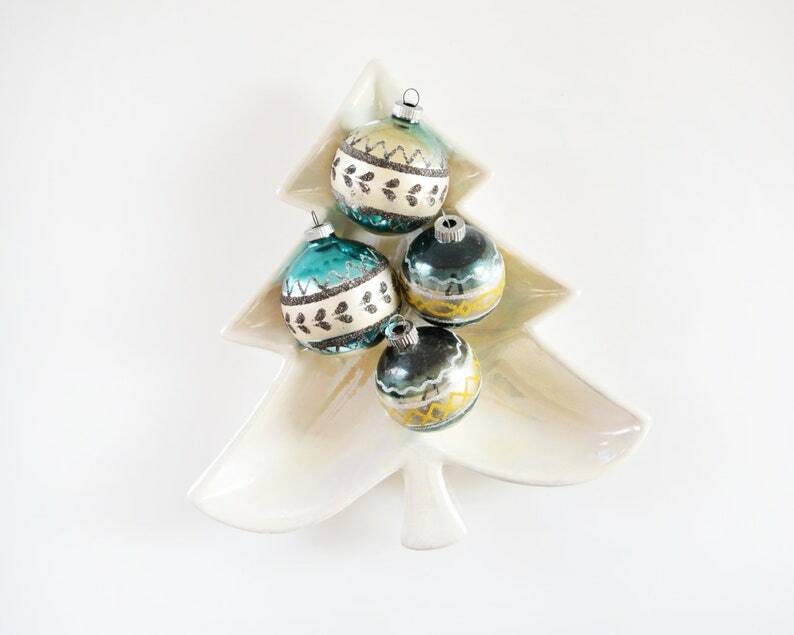 Two smaller sized ornaments that are blue and white with silver and yellow glitter detail. Silver tops that are stamped "Shiny Brite, Made in the USA." These ornaments are over 60+ years old, so they do show some surface wear to the color and glitter, please see photos. Listing is for four ornaments only. Width of blue & white: 3"
Width of blue, white, & yellow: 2.5"
Condition: Good vintage condition (see description for any flaws). Please note: The shipping cost represents coast to coast rates for the US. If the actual shipping cost is less than $2 from my shipping cost I'll refund the difference.